Joseph was born June 9, 1889 in the town of St. Remi, in the province of Quebec, Canada to Philorum Oligny and Marie-Azilda Bessette. He married Marie-Anna Saurette May 30, 1912 in Holyoke, Massachusetts. Joseph died March 17, 1966 in Lowell, Massachusetts. He was buried in St. Joseph’s Cemetery, East Chelmsford, Massachusetts. Click here to view the family sheet. Note: requires Adobe Acrobat Reader. View the Drouin image of his birth and baptism. 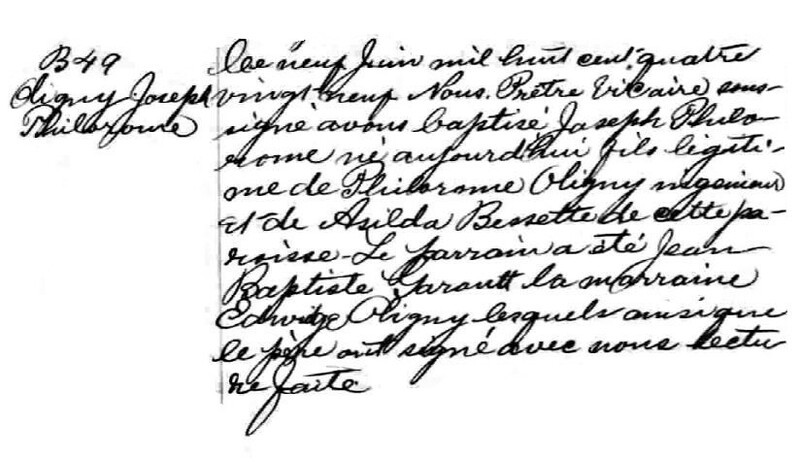 View the marriage records of Joseph Philorum and Marie-Anna Saurette. 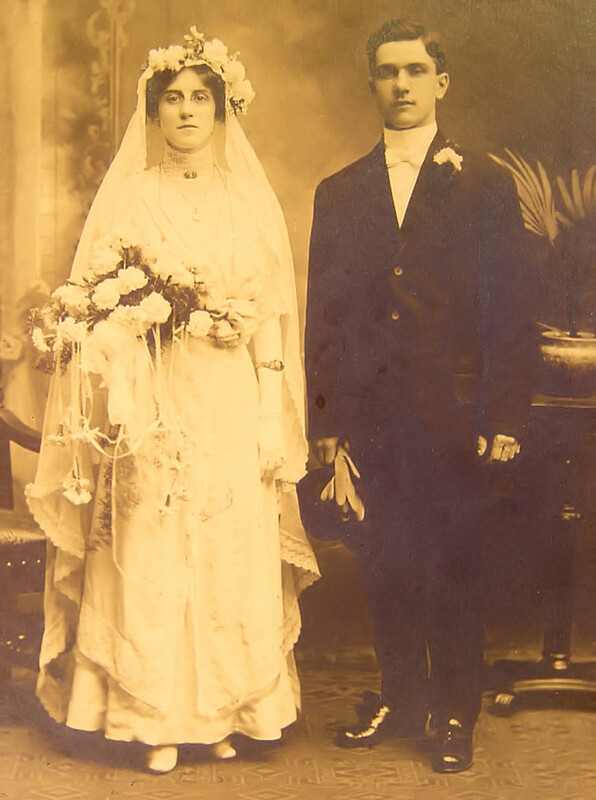 View the wedding photo of Marie-Anna Saurette and Joseph Philorum. 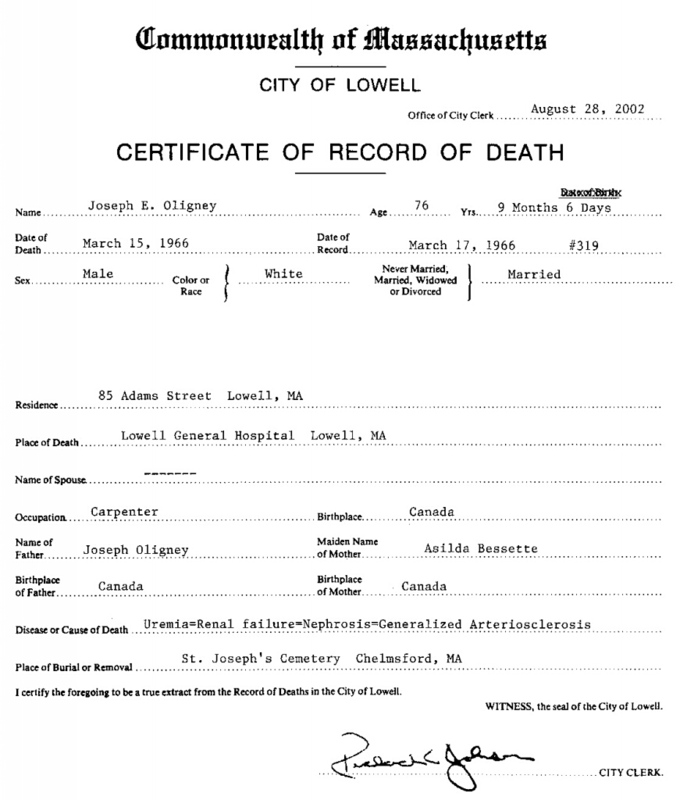 View the death certificate of Joseph Oligny. View the tombstone of Joseph Oligny. Joseph and his family appear to have immigrated to the United States on or about September 15, 1891. They crossed into St. Albans, Vermont via the Central Vermont Railroad. Joseph would have been around 2 years old upon entering the country. The 1900 U.S. Census has his family living in Holyoke, Massachusetts. His father is not listed with the family for some reason. You can view the 1900 census image here. In 1914, Joseph filled out an official government form, Naturalization, Declaration of Intentions. From this document, we learn that he was 5 foot 7 1/2 inches tall, weighed 141 pounds, had black hair and brown eyes. At this time, he was residing at 75 Front Street in Holyoke, MA. The Census of 1920 found Joseph living on Lyman Street in Holyoke, Massachusetts with his wife Marie-Anna and their two small children, Irene and Roland. At this point, the chronology gets interesting. According to court documents, Marie-Anna filed for divorce in 1916 citing that her husband had abandoned her and her small children. But, the 1920 census has them all living together. What is known for certain is that Joseph leaves his family and moves to the city of Lowell, Massachusetts to live with his mother and sister. That information was found in the 1930 census. Interestingly, his name is listed as Phil Oligney. He remarried, around 1932, to Leonida Perrault in Lowell, Massachusetts. They have at least one child together, but possibly two. They live together, in Lowell for over the next 30 years with Joseph passing away in 1966 and Leonida in 1968. Take a look at Joseph’s certificate of death. She is buried in the same plot as he is, but there is no engravement of her name on the stone. Here is a picture of the grave marker in St. Joseph’s Cemetery, East Chelmsford, Massachusetts. 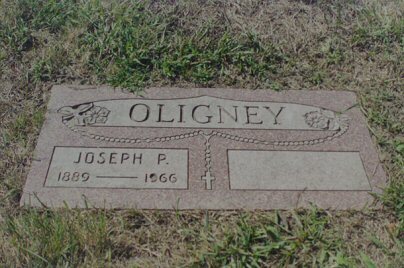 I have seen the marker for Joseph’s grave and the odd part is that the spelling for Oligny was Oligney. There is no way to be certain at what point in time he changed the spelling.